''I finished my 2-player map on which I've been working on for some time now. It's called sunstroke, because of the red, sunny and hot appearence of the map. 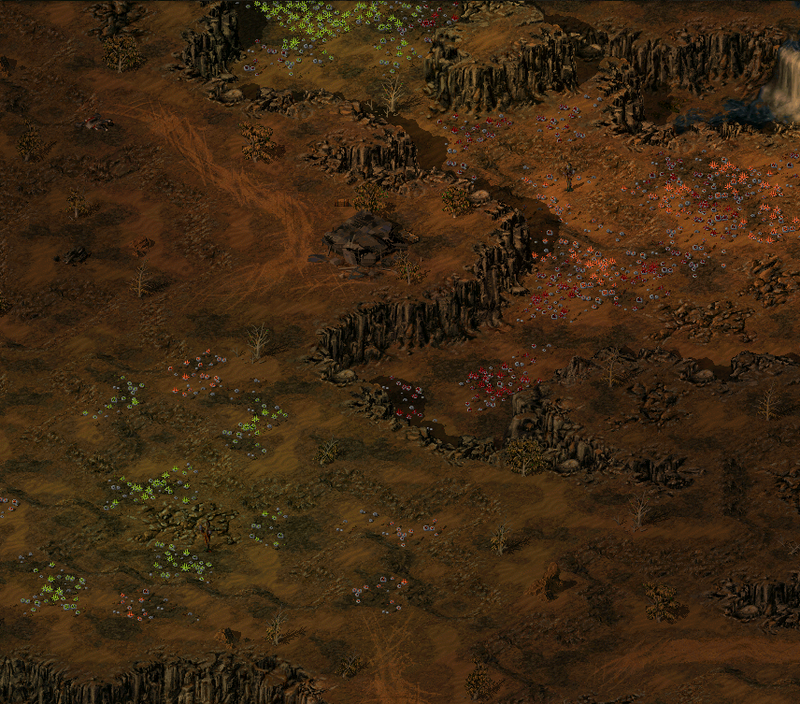 On the map you'll find three different, new types of tiberium; DarkLime, DarkOrange and Burgandy (in order of value, low to high). There are also two veinholes, which are mostly for visual puposes so they don't grow. The map has a complex, strategic lay-out, and I tried to make the map as fair as I could. Furthermore there are two 'Tech' structures to be captured. An Old Weapons Factory will give you the right to build Mammoth Tanks, and an Old Temple which gives you Black Hand Riflemen. There's also a day-night loop (the only trigger). The nightlighting is very dark, about 0.3, and the daylighting is very light, about 0.9. I used one of Ixith's map as an example for the day-night loop, so I would like to thank Ixith for this . Well here's the map, a couple of screenshots showing the max day and night lightings, a minimap and a megamap (with lighting of about 0.6). You should really give a more, "Detailed" description on what you think of the map, Sarpedon. I remembered when this was first posted as a WIP, progress has been slow, so i'm guessing that this will be a fantastic map! 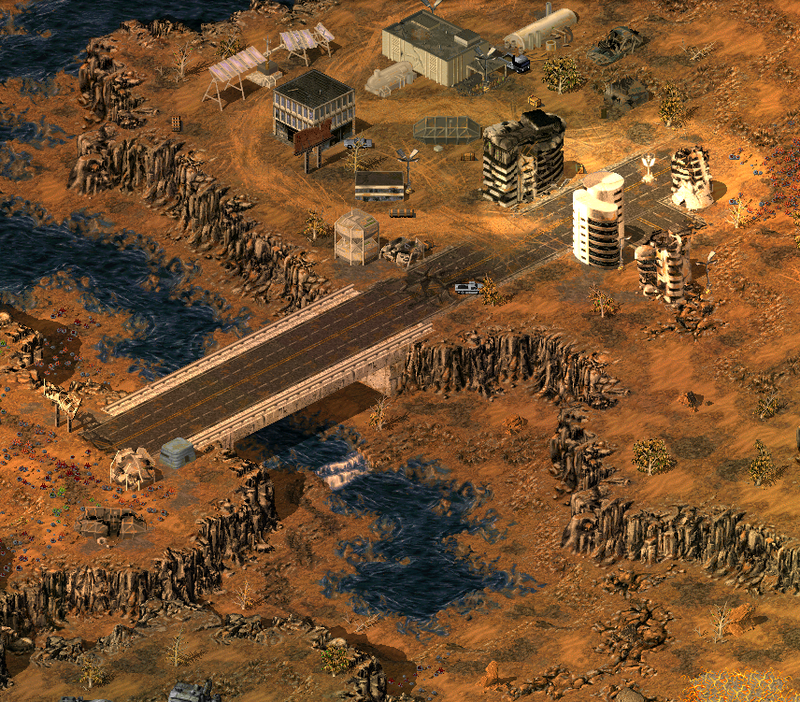 I'm just sorry that i can't play it, i've not got Tiberian Sun anymore! Only RA2! you used one of my maps as an example and credited me lol and BTW your day/night times from the loop look REALLY good. seriously though i was just looking at this map yesterday in its WIP thread thinking "when the hell is Aurora gonna release it?!" XD I must have some good intuition or something that told me you were going to real soon. lol This is a must play and im off to play it. I have a great feeling this map will get spotlighted. Agreed on spotlight. This map is great! Beautiful lighting, lots of resources, and lovely trigger work on the loops. Plz spotlight this map kthnxbie. Yeah, the day-night loop is pretty much the same as in your map, except that you used locals, and I didn't. But anyway, that map gave me a nice example of a day-night loop, so again, thank you . Yeah, as I already mentioned on msn, because the map was already taking so long, and had already been delayed so much, I just wanted to release the map as soon as possible. Anymore comments? For example did anyone like/dislike the map layout and structure? now this is a map i like, good lighting, nice layout... brilliant work here! "Alrighty, back from a trip. - Everything is mostly good, spotlight this map!" Nothing to say..I think just the same as you think about your map. Strange color, I like it. Orange lighting makes the map look cooler. The map looks wherry cool! Ion storm over my house! Run! well i played it and like said this map deserves a spotlight. Only problems were that the AI attacked me in the same spot 98% of the time so all i had to do was set up a large defense there and i was good. layout: 10/10 it was beautiful....its just a shame the AI didn't use it all. ARE YOU FREE FOR MODDING?